Judge Suzie Merkley served Precinct 3 as Justice of the Peace superbly for many years. The very least we can do to honor Suzie’s legacy is to fill her vacancy with the very best candidate available. If you have time, do your own research. If not, seek the opinion of someone whose judgment you consider to be unquestionable. Several things have surfaced during this campaign for Justice of the Peace that are problematic. 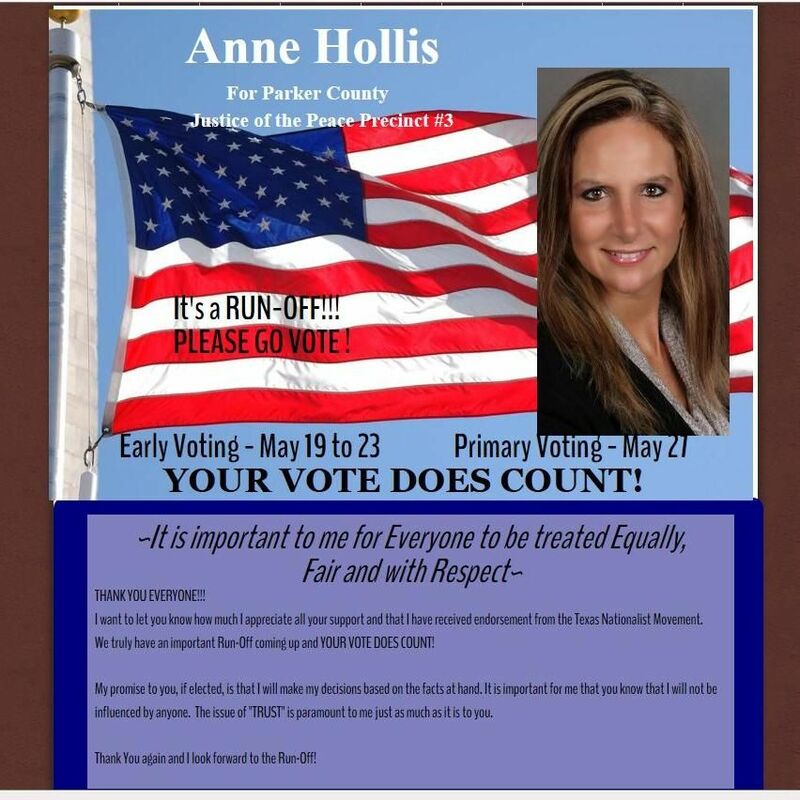 Official records are at odds with some of the claims made by Anne Hollis about her past, and about what appears to be violations of her oath of office. How long she has been married and to whom are details that would normally be of little concern to folks who are trying to choose the best candidate. So why are there inconsistencies? Why would anyone be dishonest about that? Hollis made a public statement again March 14 at a monthly TEA Party meeting saying she has been married 18 years and that she married in year 2000. But 43rd District Court records show that Hollis was still Anne Marie Garner as of July 25, 2006. 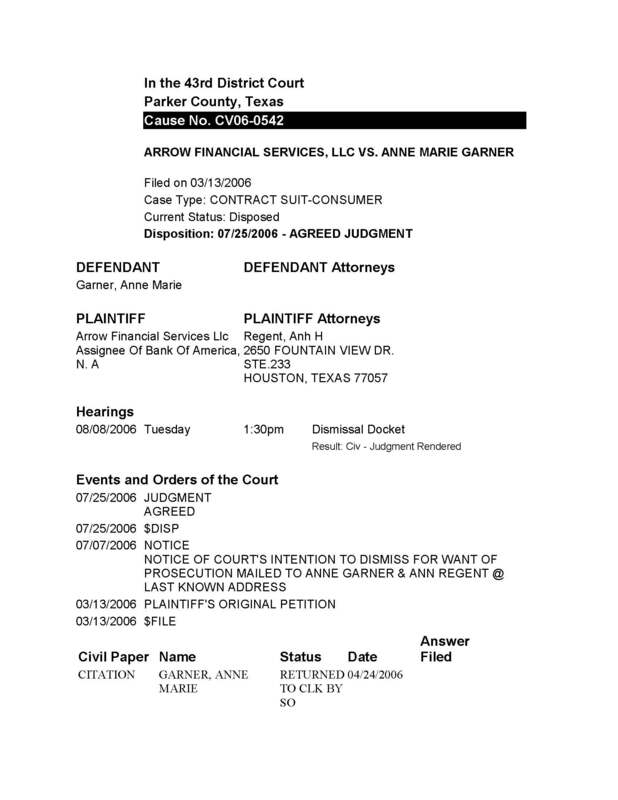 Details of significance in this document are Anne Marie’s last name in year 2006 and the filing date of the document. The question then becomes…If she married Mr. Hollis in 2000, how could her name be Garner in 2006? Should there ever be a time or circumstance when we find ourselves questioning the integrity of our elected officials…especially a JUDGE? 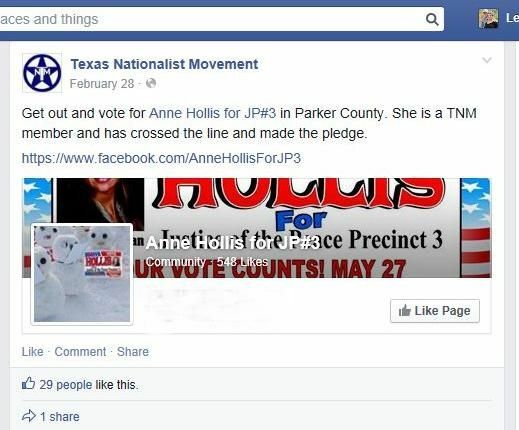 Next time you run across Hollis ask her about the endorsement she received from the Texas Nationalist Movement, an organization that advocates for the independence of Texas. Ask her about the oath she swore before becoming a Deputy Sheriff? Ask her if she swore to defend the United States Constitution against ALL ENEMIES, FOREIGN AND DOMESTIC! Now…on her website she boast about being endorsed by the Texas Nationalist Movement, an organization whose primary goal is to secede from the United States! Do we want judges who support the notion of Texas Independence…who only obey their oath when they feel like it? Or… do we want judges who can be counted on to honor the oath they swore to uphold… and simply apply existing law? Hollis supporters think she is a good and decent person, and that she is capable of serving satisfactorily as JP. Unfortunately, I can’t get beyond the documented facts that paint a totally different picture. Follow the truth wherever it leads. We encourage everyone to participate in any of the discussions found on ParkerCountyBlog. However, we reserve the right to delete posts (comments) that are in violation of our Blogging Policy. Therefore, we suggest you read our policy if you are unsure of your intended remarks. Inappropriate posts and/or comments shall be deleted without explanation or comment. How is supporting a referendum by the people on the question of Texas independence not upholding an oath to the Texas Constitution or the U.S. Constitution. The U.S, Constitution does not forbid the goal of self-determination by it’s citizens. The Texas Constitution Article I Sec. II states that all political power is inherent in the people and the people have the right to alter or abolish their govt. as they see fit. This is the same Constitution accepted by the U.S. Congress when Texas was readmitted into the Union. There is no conflict by exercising our constitutional rights. Let me get this straight. Your whole argument against her character is that she continued to use her maiden name and that she puts Texas first and supports Article 1 Section 2 of the Texas constitution? I’m not sure if you know this or not but this is not the 1950’s anymore and some women, especially professionals, continue to use their maiden name for a variety of reasons from established reputation to just simply wanting to. Sometimes they just have other things that matter a little bit more going on and never get around to it. I have had two doctors, including one in my own family, who have continued to use their maiden name or even their first married name after being remarried. It’s not uncommon and, quite frankly, I’d be to bring that up in a race as important as Justice of the Peace. I’m sure that Judge Merkley even presided over a few marriage ceremonies in which the bride exercised her option to use the name of her choice and to change it or not. The fact that Mrs. Hollis supports the peoples right to exercise this option tells me that she is not only a patriot of liberty but can recognize what’s best for the people of Texas. As members of the Texas Nationalist Movement we seek the political, cultural, and economic independence of Texas and the return to a constitutional republic. Supports range from the committed to those who simply believe that the people of Texas should have that voice. Mrs. Hollis has boldly decided to stand with the people on the side of liberty and justice. Voters are smarter than to fall for typical mudslinging tactics of typical politics. Mr. Leatherman, you are better than that, I’m sure. I wanted to offer my continued support for Ann Hollis. I am not concerned with her past marriage(s). I will overlook this issue just as I would overlook the issue if Ms. Hollis were gay, or a Muslim. I am only concerned with how she will uphold the law. I believe she can do as good a job as any of the “status quo” that are running for the seat. She will uphold the law, of this I feel confident. When other politicians have had their personal affairs exposed by the media, those same issues were downplayed and made into an unimportant matter or an extremely important matter, depending on how it benefited the desires of the media and the party or candidate(s) of their choice.. That does not affect their job performance, merely public opinion. Here I see the same thing. Another media writer expressing his displeasure with a candidate other than his own choice, using his pen to destroy one candidate and lift up another. I find the motives in modern journalism questionable these days. It is flagrantly evident in the national media outlets, but it has seemingly trickled down to the local level as well. Ms Hollis still has my support. Her endorsement by the Texas Nationalist Movement seems trivial to me. What’s wrong with that? We Texans have our own culture and our own thoughts about independence. Our State Constitution makes mention of the rights of the people concerning government in the first few paragraphs. When the “status quo” isn’t working to protect the citizens from an overbearing federal government, then a sovereign Texas should be the result. Mr. “Leatherman,” it’s one thing to debate qualifications of candidates, quite another to simply sling mud. You require some education about the Texas Nationalist Movement, its members, its purpose and what we’re working for. The Texas Nationalist Movement works to secure, support and defend the economic, cultural and political independence of Texas. The organization was formed in 1995 and has worked with numerous state and local legislators and has worked hand-in-hand with various Tea Party organizations, in defense of Texas values, Texas culture, Texas economic freedom and Texas political freedom. Many of those who have joined the Texas Nationalist Movement have taken that oath you speak of in reference to Ms. Hollis, an oath to support and defend the Constitution against all enemies, foreign and domestic. I took that oath when I joined the U.S. Marine Corps and served in the Desert Storm era. Although my enlistment ended six years later, I was never released from, nor have I ever released myself from, that oath. Seeking independence for Texas in no way violates that oath, sir. We do not consider the United States an “enemy,” nor do we support any type of insurrection against the lawful government; we reject affiliation with any of the so-called “militia” movements and even with other nationalist organizations in other states. Most assuredly we reject any affiliation with any racist or ethnic-separatism groups. Our membership is diverse, we welcome all people who support the idea of a free and independent Texas. We engage in the mainstream political process — as Ms Hollis is doing, as dozens more are doing for state and local offices, and as I am doing as the Republican nominee for State Board of Education District 3. We vote, we attend precinct and county and state conventions. Until such time as my fellow Texans peacefully exercise their God-given right to self-determination (a right affirmed by the United Nations Charter) and we have successfully concluded negotiations with the federal government to embark on sovereign nationhood, I will faithfully support and defend the Constitution of the United States and of Texas. There is no conflict between that oath and my Texas Nationalist membership. Admittedly, I had thoughts like yours back in 1997 when as the managing editor of the Katy Times newspaper I got this notion to interview this president of the Texas Nationalist Movement and to rake him over the coals. But by the end of our interview, I found myself saying, “Hmmm, these guys may be on to something.” In 2001, when the Patriot Act made it clear the federal government was marching toward tyranny, I joined the TNM. Mr. Mundy, you and the others who have commented about TNM make valid points, and I commit to you that I will make an effort to learn more about the organization. I must say however, my 32 years of active duty military makes it difficult to turn my back on the oath to which I swore. I still find no fault in the US Constitution, onlly with the people WE elect to represent us. I believe if we don’t change the culture that produces incompetent and corrupt candidates and office holders, it will not matter if our government is called the country of Texas or America. I am so proud to have her as a friend. As I have said in the past, NO ONE is perfect and no one is expected to be. We must learn from our mistakes, correct them and help others. If you ever have any questions about me or any of my life choices and experiences, I will be more then happy to answer them. The question has been raised about a civil contract suit that was filed against me in 2006 in my Garner name. I met John in July 1996, we were together for 4 years then we married in July 2000. Prior to getting married, I had bills in the name of Garner, which included a credit card that I had to use after my divorce in 1995. There were bills to pay, I took care of my children and as a single mom at 25, it was very difficult. I worked in the PC Jail, went to College and lived on my own with my 3yr old and 6yr old boys. I could only afford to pay the minimum amount due on the credit card. The balance grew out of control, I discontinued the use of that card but could never get ahead on it. In 1999, I contacted the Credit Card company and made an agreement with them to pay the card off for a fairly reasonable amount. I believed that since it was an agreed amount and I paid it off by Dec 2001, which was paid off before the time given. I did not hear anything further from the CC company until April 2006 when I received a citation. I immediately contacted the Financial Company and explained the agreement, then I had to locate the documents. After 12 weeks of back and forth talks, we came to an agreement that I would pay a portion of the interest that they said I stilled owed. I was very shocked because I believed everything had been taken care of, but how do you argue with a financial company who can ruin your credit? 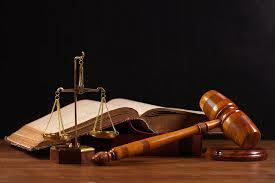 I paid the amount and the Financial Company sent the documents to the court, the civil case was dismissed. Most people are going to go have hard times and financial problems at least one time in your life. I was a young mommy and chose to take care of my children by using a credit card because I felt that there was no other option for me. I learned a huge lesson when going thru this and can understand that there are some people who need assistance and time to pay there bills. But the bills do still have to be paid and arraignments can be made to come to a resolution. I took responsibility for my financial choices and I expect everyone else to do the same. There is one further issue that needs to be addressed. Where does the name “Dusty” come from? That is not his name and it is illegal to put a fraudulent name on an official document. The name on the document is required to be a legal name and according to the research that I have done, “Dusty” is not a legal name. Steve, have you asked Zan Prince what the rule is? I couldn’t find it online.